Analyzing or designing the various features and functions of a software system can be daunting, especially when there are multiple actors and other interfacing systems involved. Thankfully, analysts can turn to use cases to make this process much easier. This article introduces the different types of use cases you may encounter and identifies some of the ways use cases are represented. Since Ivar Jacobson first formulated textual and visual modeling techniques for use cases in 1986, quite a bit has changed. However, certain key factors have remained effectively the same; particularly the methods employed to identify use cases. The first and probably most critical step to identify a use case is to first identify the actors because the use case will be written from their points of view. Next, the actor’s functions must be identified as well as the actors’ actions within the system. Last but not least, it is important to identify all external events that can influence the actors and system as the actors perform their functions within the system. Below is an illustration of the identification process. So how do you identify a use case? Well, suppose that ABC Corp has customers that must register on ABC’s online portal in order to receive services. Using the Use Case Identification method, we can determine that the actor is the customer. The actor’s function is to provide personal information to complete his/her profile. The actor’s actions in the system include accessing it to provide personal information. Next, we identify external events. These may come from multiple sources and can also include other use cases. In this example, it will be login credentials provided to the customer by a system administrator (a poor user provisioning method, but that’s a conversation for another day/blog article). In order to provide the credentials to the customer, the system administrator will need to first log into the system themselves with their own credentials. This process has nothing to do with the customer and as a result, “Provide Credentials” is considered an external influence and can be considered its own use case even though it’s performed in the same system (this concept is known as use case partitioning). 1a2. Proceed with Alternative Course 1b. There are basically two types of use cases analysts can draw from: Business Use Cases and System Use Cases. Business Use Cases are more about what a user expects from a system while System Use Cases are more about what the system does. Both use case types can be represented by diagrams or text. Diagrammatically, both types of use cases are denoted differently. In our example, we have used the System Use Case. When representing the use cases in textual form, both use case types can be presented as either “informal” use cases or “formal” use cases. “Informal” use cases are quite brief with just enough information to get the point across. “Formal” use cases are meant to be more detailed. 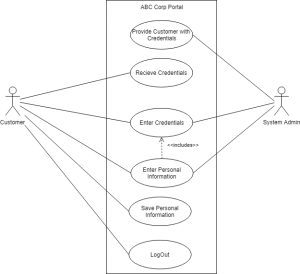 ABC Corp’s use case UC001 is a good example of a “formal” use case. Below is an “informal” example of use case UC001. Even though the examples listed above are in tabular form, they are still considered examples of the text-based method of presenting use Cases. As mentioned above, use cases can also be represented using diagrams. The UML notation is the most widely used standard. Use case diagrams can be particularly helpful when multiple actors overlap and perform the same function in the same system. Being able to represent all actors and their interactions with the system in one diagram gives a better picture of the dynamic system behavior. Although this is a “by the book” standard description of Use Cases, sometime the objective to achieve in your business analysis efforts is just to simply inventory use cases, rather than launching into a fully dressed illustration of each use case’s steps. If so, then a great way to do this fast is with the System Context diagram instead. It can be created rapidly, and also be the basis for more detailed use cases as described here. Tawanda Cyril Mahachi worked in process design, analysis, and architecture.